The Foreign Office warns in its advice for visitors to the UAE of subsequent new laws. "Showing sympathy for Qatar on social media or by any other means of communication is an offense," it says. The UAE hosted the recent Asian Cup 2019 football tournament. Qatar beat Japan 3-1 in the final on Friday to win the competition for the first time. 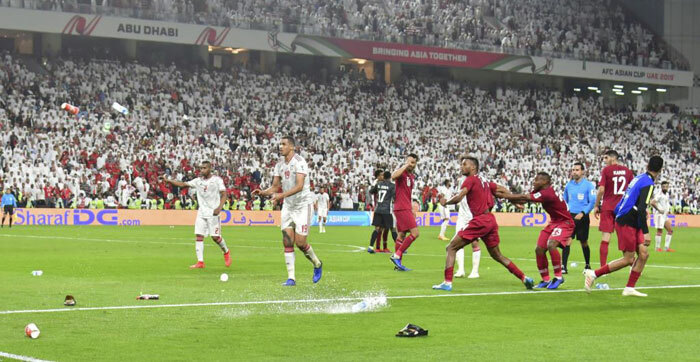 Qatar thrashed the UAE 4-0 in the semi-finals when their players were pelted with shoes and plastic bottles. The Guardian newspaper reported that Ali Issa Ahmad, 26, had traveled to the UAE for a holiday, bought a ticket for the second round match between Qatar and Iraq on Jan. 22 and wore a Qatar shirt to the game. Ahmad's friend Amer Lokie said he had called him on Thursday in his one permitted phone call. Ahmad "says he was arrested and beaten after being accused of wearing a football shirt which promoted Qatar," Lokie told the Guardian.